Great finds! I actually picked up some Advil as well. Question though. In regards to the L’oreal coupon, I do not see anywhere that it says “Manufacturers Coupon”. I thought that was required on the coupon for the cashier to accept it. Maybe I am just blind and can’t see it. Any advice on what to say if the cashier says no would be greatly appreciated!!! Thank you for your reply. I will try to buy some tomorrow (last day!!!) and see if it works. Yes, I got the Advil Cold and Sinus (10 pack). Can’t go wrong with that deal. Do you know if that is actually the normal price or if they are having a secret sale? 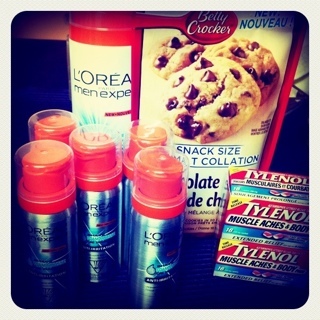 Because I checked Shoppers Drug Mart and Rexall. Both have the 10 pack for $7.99!!! The coupon worked!!! I went during my lunch break to pick up some money makers. The bin was FULL of shaving gel, but I was only allowed to take 6. So happy to hear you got them! I saw a few people saying they were only allowed to take six at a time… That is too bad. I never tried to get more then that in on go though. Happy you go some at least!